Are there any warranties available for the products you offer? Yes, we offer a variety of different warranties. Each individual product has their own warranty covereage. You can read all about our warranties by clicking on the warranties tab which is located under the OUR WORK and ABOUT US subtitle. You can also always call us directly at 507-373-3435 and we will have someone explain the warranties to you over the phone or have someone come speak to you at your home. Bay vs Bow Windows: What's the Difference? The upgrade or addition of a projection window is a popular way for homeowners to boost their curb appeal, expand their view, and increase a room’s functional living space. If you’re just starting to research replacement window options, you’ve probably heard mention of both bay and bow windows—but what’s the difference between the two, and which style should you choose for your home? Here are the benefits of each type and a few factors you should consider when making a decision between the two. A bay window is the combination of three or more windows that angle out beyond the exterior wall. Our Certified Master Installers can expertly install bay windows in four projection angles up to a 90 degree box bay. Since the window protrudes outside the wall, you can enjoy an extended view and even additional seating space. Similar to bay windows, bow windows extend beyond the exterior wall, but sweep away from the wall in a graceful arch of four, five, or six windows. This elegant window style is typically larger than the bay window style and has more glass area because of a curve in lieu of corners. As with bay windows, adding a window seat to your bow window can be a quick and easy room addition. If you’re adding a bench seat below your window, consider it an opportunity for extra storage! If you’re looking to make your room appear bigger and brighter, bow windows are the perfect solution. Bay and bow windows are typically associated with Victorian architecture—you might think of “The Painted Ladies” in San Francisco for instance. Dress your bay and bow windows with grilles, various roof options, and colors that complement the architectural style of your home. These windows can be flexible when it comes to each individual window type. You can choose a combination of double-hung, casement, picture, or awning windows to create your bay or bow window. If the idea of a bay or bow window is new to your home, note that they can be used as a replacement in most large window openings—so if you’re looking for something new, we recommend talking with our experts! It’s in your best interest to schedule a free consultation with one of our design experts to talk through your exact needs so you can rest assured you’ve made the right decision. Schedule a free consultation and start your replacement window project today! Does Home Solutions have a contracting license? If so, can you provide proof that you do carry a certificate of liability insurance? Yes, Home Solutions Midwest has a contracting license and we'd be happy to provide proof of liability insurance to any prospective client. How do I clean my Renewal By Andersen Double Hung Windows? Please refer to Renewal by Andersen’s Care and Maintenance Guide about best safety practices when working around windows and doors. If it’s still a little chilly to open your windows, start with cleaning your interior glass. First, check to see if you have removable interior grilles. If so, remove them by lifting them away from the glass near the edge of the frame, leaving the grille clips in place. For more information on the removal and replacement of interior grille clips. Then, clean the windows as you normally would. Renewal by Andersen’s double hung window is designed specifically for the easy cleaning process. To clean this part of your window, unlock your window and lift it up about two inches. Next, grasp the lower sash—using both hands—at the outer edge close to the wash assist tabs, and pull firmly towards yourself. The sash will then tilt inwards toward you after slight resistance. Continue to tilt the sash so that the glass is supported by a durable object—like a chair. NOTE: Do not tilt the sash more than 90 degrees. Start by leaving the lower sash in its title position on its durable object. Then, slide the wash assist tabs (the same ones used for the lower sash) up back to the top of the frame. By doing so, you are able to lower the upper sash until you can comfortably reach the title wash tabs that are on the top edge of the upper sash. Make sure the space between the upper and lower sash is at least one-inch apart from each other. Next, move the assist tabs inward while simultaneously pulling the upper sash towards you, and continue to tilt it until it rests gently on the lower sash. Now you can finally clean both the lower and upper sash. You now need to close the upper and lower sashes back into their original positions. Start by lifting the upper sash from its lower position until it snaps back into a completely vertical position. Next, push the upper sash down about an inch before sliding to the top of the frame. Then, lift the lower sash from its lower position until the sash snaps back into a vertical position as well. Finally, push the sash into its assigned place. 5.) If you removed your interior grilles: Put them back on your window by placing the grille against the glass and firmly pressing into the grille clips and all along the grille. Make sure the grille fits snuggly on the glass. If you have anymore questions feel free to call us and we'd be happy to have someone show you how to fully take advantage of the Renewal by Andersen windows. Gutter Helmet's secret is the principle of surface tension. Hold a glass under a running faucet and you can see this principle at work: the water flows around the outside of the glass. Similarly, water clings to your Gutter Helmet as it runs down the roof, flowing freely into your gutters. Pine needles, leaves and other debris, however, fall harmlessly to the ground below. Your gutters stay open and clear, with no work on your part! How efficient are the Renewal By Andersen Windows? Andersen Corporation's heritage includes a long-standing commitment to energy efficient products and environmental stewardship. Andersen, including Renewal by Andersen, earned the 2017 ENERGY STAR® Partner of the Year - Sustained Excellence award. Renewal by Andersen® window replacement can save you money on your energy bills. Our newest glass option, SmartSun™ glass, is our most energy efficient glass option. Plus, the great combination of our exclusive Fibrex® material, High-Performance™ Low-E4® glass, and expert installation means your Renewal by Andersen windows have excellent NFRC ratings. Our ENERGY STAR® certified units are available with select glass options. Green Seal estimates that if all windows in the U.S. were as energy efficient as those made by Andersen Windows, Americans would save up to 2.5 percent of the annual U.S. energy consumption—an estimated 200 gallons of oil for every household in the U.S. Renewal by Andersen’s sustainable approach to window replacement means Mother Nature smiles just a little bit brighter. Construction waste is a major source of landfill waste in the U.S. Every day, we replace windows that are less than a decade old. Renewal by Andersen products are designed to stand the test of time and are backed by one of the strongest, fully transferable limited warranties in the business, meaning decades of energy-cost savings for you—and less landfill waste for our planet. How long has Home Solutions Midwest been in business? Home Solutions Midwest has been in business since 1979. How much does the Gutter Helmet system cost? Installation cost depends on a few factors, including: the number of stories of your home; the need for special equipment to perform the installation (due to the lay of the land or other variables); the condition of your roof; any fascia repair and replacement; the size of your gutters the type of roof you have the overall length of all of your gutters; and the number of corners on your home. After inspecting your home, your Gutter Protection Expert will provide a firm quote. Request a no-obligation quote today. We strongly believe that your home is your most prized possession and we will treat your family and property with the out most respect. Our master installers go to extreme measures to make sure the area they are working is cleaned up and well taken care of. I'm having a hard time imagining all of the window styles, grilles, colors, and hardware options. How can you help? I'm researching replacement windows and considering Renewal by Andersen. What's the first step I need to take? What are some things new homeowners could do to save money? Buying a home is a big investment. Not only are there the downpayment and closing costs, but you often need to buy incidentals such as blinds, shower curtains, paint and new furniture. If you're looking for some low-cost ways to save money in your new home, here are some simple things to consider. Install a Programmable Thermostat. This is an easy task that just requires a screwdriver. For a one-time $30 investment, you can save as much as $400 a year in heating and cooling costs. It really doesn't make sense to run your heat or AC when no one is at home. Just program the thermostat to come back to the right temperature when you're heading home from work each day. You'll never be uncomfortable, even when you open your utility bills! Replace Air Filters & Showerheads. New air filters help keep your HVAC system from working too hard. Plus, new ones cut down on the dust in your home. While you're replacing those, also consider replacing your shower heads with low-flow showerheads to save on water usage. Change Out Incandescent Bulbs for LED Bulbs. Not only will you save money on the bulbs themselves, but the difference in the cost to run them is significant. One $5 LED bulb lasts as long as twenty $1 incandescent bulbs! Because an LED bulb that gives off 60 watts of light only uses 10 watts, your energy usage is significantly less. On average, homeowners save $180 per LED bulb they install. Re-Caulk & Weatherstrip Doors and Windows. Your windows can be big culprits behind energy loss. By keeping them well-maintained with fresh caulk and weatherstripping, your home will be better sealed. Caulk requires just a caulk gun, and weatherstripping is self-sticking and easy to install. Check Your Trees & Shrubs Trees around your home can provide shade in the summer which will help lower your utility bills. However, when the branches of your trees and shrubs touch your home's siding, roofing or gutters, you can end up with big repair bills. Trimming back your shrubs will help your siding last longer and reduce maintenance on it. Cutting back tree branches will also reduce the risk of roof damage and help keep leaves out of your gutters. Of course, if you have rain gutter shields, you won't need to worry about leaves in your gutters. In fact, installing rain gutter shields can save you money because you won’t have to worry about paying someone to clean your gutters. To learn more about Gutter Helmet call us today at (507)373-3435. What are the true costs of replacement windows? our window frames are rotting, your windows leak air like it’s their job, and you dream of a picture window where your double-hung windows live. In short, it’s time for window replacement. Surprisingly, we often replace poor quality windows that are less than 10 years old. You could purchase cheaper, low quality windows, but the chances are you’ll have to replace them again very soon. By investing in quality installation and materials you’ll have beautiful, functional windows for years to come. Think you might want to sell your home in the future? Take stock of your windows. Beautiful windows can improve curb appeal and a respected brand name can add value to your home. While not a fun topic, it’s important to know what you’re comfortable spending. This will help dictate what project you can do now, and which projects you might want to tackle in the future. Consider the financing options available to you, such as deferred payment options. Do you want to knock out your double-hung window and replace it with a larger picture window? Are you looking to replace every window in your house? What hardware tickles your fancy? All of these considerations impact the cost of your replacement windows, and should be in your consideration for what makes the best sense for you and your home. If these options seem overwhelming, our consultants are more than happy to schedule a free in home consultation to help you find the best solution for you desires. For more information on our quality materials, financing options, limited warranty or any of our window options visit homesolutionsmidwest.com or give us a call! What colors are available for Gutter Helmet and is it customizable? Gutter Helmet is essentially invisible because it is designed to blend into your roofline. You can choose from several colors to match your roof shingles. Colors include: Charcoal, Brown, Bronze, Green, Black, Sand, Copper, Timber, Sand Gray. We also offer two new colors – onyx and canyon in our Stonescape-Granular Stone Paint Finish. What do past homeowners say about Renewal by Andersen? We have more than half a million window and patio door replacement jobs out there. You can see some customer reviews and testimonials by reviewing them on the Renewal By Andersen Corporate website. What exactly is Gutter Helmet? Gutter Helmet is a patented gutter protection system designed to be installed right over your existing gutters. It keeps leaves, pine needles, and other debris out of your gutters while allowing rainwater to flow freely. This revolutionary system protects your home from the harmful effects of clogged gutters, such as severe water damage and insect infestation. Gutter Helmet guarantees that you'll never have to clean your gutters again! You'll never have to worry about getting on that ladder. Gutter Helmet is the superior gutter protection system on the market. More homes are protected by Gutter Helmet than by Leaf Relief or any other gutter guard brand! With the different types of windows, learning the ins and outs of all of them can be difficult. That’s where we step in! Have you heard the term “casement window” bandied about but not exactly sure what a casement window actually looks like? Read on fellow window enthusiasts – we’ll break it down for you. So what is exactly a casement window? A casement window is any window that is attached to its frame by one or more hinges. Specifically, windows attached to the frame on the side (windows hinged at the top are awning windows, but more on that later). Basically they’re like doors, only instead of opening with a knob they open with a crank. Casement windows are actually our most energy efficient, ventilating window style. This is because casement windows close tightly, locking at multiple points to produce a weathertight seal that minimizes air infiltration. 2. Great for hard to reach areas. - Need a window above your cabinets, counters, or some other spot where opening requires a bit of a reach? Casement windows are designed for easy opening and surprisingly easy cleaning. 3. Ideal for natural ventilation. Casement windows can be hinged to open at nearly any angle. This allows you to direct breezes into your home for natural ventilation. Take the most of those spring breezes! 4. Provides excellent natural light. Are you dying for a picture window, but don’t want to lose functionality? Casement windows provide the full sunlight, giant expanse of a picture window but they open! It’s the best of both worlds! Our Certified Master Installer program takes “professional” to the next level with meticulous training, extensive supervision, and high expectations. Prior to certification, we require all trainers and installers to demonstrate their knowledge of construction materials, building codes, and installation methods. So what is a French door? French door (n.): A door, usually one pair, of light construction with glass panes extending for most of its length. They also can be referred to as French windows. French doors are perfect for warm summer days. You can easily bring the outdoors inside with such a door. Renewal by Andersen’s 5-point locking system on its Frenchwood ® patio doors not only offers an increase level of security but also improves energy efficiency. Of course French doors are extremely functional, but the primary function of a French door is its aesthetic features. French doors can create a dramatic impact on your home. See the picture below on how this style of door can make your indoor and outdoor living spaces interconnected. Because of its aesthetics, Frenchwood ® doors prove to be a smart investment. With the addition of this type of door, you can increase the potential sale value of your home. Consult your local real estate agent to see if French doors are a wise addition for you home. Installation of a replacement window isn’t simply a matter of putting a standard-size window into a hole in the wall. It’s a matter of expertly fitting YOUR custom window into YOUR home. Replacement window installers need to be prepared to handle any number of challenges such as variations in wall materials and thickness, various types of casings or sill constructions, changes from house settling, and even unforeseen structural damage. This is why we only hire the best installers—folks who are professional craftspeople experienced in installing windows in homes of all shapes, sizes, and styles. Our installers are proud of the work they do and the products they install, and they’re dedicated to working with individual homeowners and going the extra mile whenever necessary (and often even when it’s not). We have several different ways to get in touch with our business but our preferred source of contact would be to call our office line at 507-373-3435. Why should I choose to have Renewal By Andersen Windows installed in my home? Renewal by Andersen's Signature Service is committed to giving you the best customer experience possible, through the perfect combination of the best people in the industry, a superior process, and an exclusive product. Cost savings. Renewal by Andersen’s energy efficient windows are ENERGY STAR® certified and can reduce heating and cooling costs. Hassle-free process. Renewal by Andersen eliminates the need to work with multiple companies. We are responsible for all aspects of your window replacement and installation. 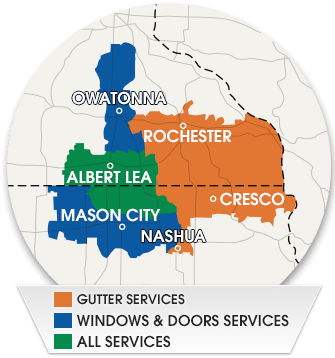 It’s the kind of service you would expect from the Andersen Windows name, and Home Solutions Midwest is committed to living up to those standards. Why should I really replace my old windows? We’ll be the first to admit that original, historic windows have a certain appeal to them. But, while they look amazing, they aren’t as energy efficient as new windows. And, with heating and cooling costs on the rise, you simply can’t afford to throw money out the window. Replacing your old windows with new ones that offer insulating features such as heat reflecting low-E coatings can save you between 10% and 25% each year on heating and cooling costs. If your windows are poorly sealed, worn or damaged, they might cause damage to your home. For instance, if your window is poorly sealed, you might lose warm air during winter. Moreover, a leak in your windows could cause water damage to the wall, furniture, and carpets every time it rains or snows. Window replacement is the most effective action you can take to avoid a situation like this. Picture this: you just can’t wait to get home and curl up under a blanket after long, stressful day at work. But, instead of the peace and quiet you were hoping for, you are welcomed by the noise of a construction site near your home. You could avoid this scenario entirely by replacing your old windows with dual-pane or laminated glass. This feature can reduce the outside noise, making it possible for you to relax at the end of the day. Moreover, these windows will reduce how noise is leaving the home as well, so you can pump up the volume without bothering your neighbors. One of the benefits that often gets forgotten when talking about window replacement is how new windows can improve indoor air quality significantly. If you replace your heating and cooling filters every 30 days, then you will benefit immensely from replacing the old windows in your home. The multi-chamber design of new windows will keep the interior air of your home pure and clear, as it is constantly filtered through your cooling and heating system. When thinking about home security, most people tend to focus on doors and fences. While all these are important, they seem to forget the fact that their windows are a vital element of home security. Old windows that don’t lock properly are a gold mine for burglars. Window replacement is a great way to ensure that your home is protected not only from the elements but thieves, as well. According to recent studies, the natural light keeps us healthy and improves our sleep quality. New windows have small frames and large panes compared to old ones, allowing more light to enter your home. You’ll be amazed by the difference new windows can make to your home. Not only they look great, but they also offer great functionality. Window replacement is a great investment, especially if you plan to sell the house someday. Nowadays, home buyers look for homes that not only look good but are also energy efficient. Old, drafty windows are a big turn off, and sellers are usually forced to reduce the price to compensate for the costs of upgrading. According to a report from the National Association of Realtors, homeowners get around 73% of their window replacement investment back when they sell the house. Even the most expensive windows won’t deliver the look and functionality you expect if they’re not installed properly. Make sure you work with the right window replacement company to truly benefit from the advantages offered by new windows. Home Solutions Midwest can help you make your home new again. Yes, we have a dedicated team that has been certified for each specific product. Once we assign an installer a job they stay on that project until it is completed. When you schedule an appointment you will be notified not only the date of when the job will start but also who will be working on your home improvement project. Here at Home Solutions we strongly believe in informing our customers about every step of the job.